IQSA members – the final Review of Qur’anic Research for 2016 is up! In the latest installment of RQR, Dr. Ilkka Lindstedt reviews Arabs and Empires Before Islam (Greg Fisher, ed. Oxford, United Kingdom: Oxford University Press, 2015). With contributions by over 20 leading experts of pre-Islamic Arabia, it is a formidable achievement in the field of pre-Islamic Arabian studies. It presents the history of Arabia from antiquity to the 630s CE, taking into account the subject’s diversity and presenting a variety of source materials. Much importance is given to the surviving material evidence in the present volume. It provides, for example, interpretations of significant new inscriptions and reinterpretations of previously published ones, many of which have previously been dispersed in hard-to-access publications, and explains their worth for the study of history. It has been (and unfortunately still is) a common habit of Arabists to look first and foremost at the Arabic historiography of the Islamic era and other literary evidence when discussing pre-Islamic Arabia. This is probably a question of habit and training: Arabists and Islamicists usually know well, for example, the Arabic works of the ninth–tenth centuries by Ibn al-Kalbī (d. 206/821-22), Ibn Hishām (d. 218/833), and al-Ṭabarī (d. 310/923), but they are not aware of the magnitude of the surviving pre-Islamic Arabian epigraphic record (numbering almost 100,000 known items at the moment). Not an IQSA member? Registration for the 2017 calendar year is open! Click HERE to sign up for benefits like access to the Review of Qur’anic Research and much more! In honor of Andrew Rippin, the International Qur’anic Studies Association (IQSA) will award a prize to the best paper delivered at the 2016 Annual Meeting in San Antonio by a graduate student or early career scholar (Ph.D. awarded 2011 or later). The prize winner will receive $250 and an expanded and edited version of the paper will qualify for publication in the Journal of the International Qur’anic Studies Association 2 (2017). Interested scholars should submit a draft of the paper which they read at the 2016 Annual Meeting at San Antonio; this draft should be no longer than fifteen double-spaced pages (or 3750 words). Submissions should be sent to jiqsa@iqsaweb.org by January 5, 2017. The prize winner will be announced by February 1, 2017. The winner should then be prepared to submit a fully revised version of the winning article by April 1, 2017. Publication of the final version is contingent upon review by the award committee and editorial staff of JIQSA. Written by Lyall R. Armstrong, American University of Beirut, and published by E. J. Brill. Available for order on Brill’s website. The Islamic qāṣṣ (preacher/storyteller) has been viewed most commonly as a teller of stories, primarily religious in nature and often unreliable. Building on material of over a hundred quṣṣāṣ from the rise of Islam through the end of the Umayyad period, this book offers the most comprehensive study of the early Islamic qāṣṣ to-date. By constructing profiles of these preachers/ storytellers and examining statements attributed to them, it argues that they were not merely storytellers but were in fact a complex group with diverse religious interests. The book demonstrates how the style and conduct of their teaching sessions distinguished them from other teachers and preachers and also explores their relationship with early religio-political movements, as well as with the Umayyad administration. Efforts at furthering the understanding of the nature of the rise of Islam and its earliest interaction with Christianity would do well to recognize the central role of language in the shaping of religious identities. With the rise and spread of Islam, Arabic was religiously adopted, sacralized, and maximized. Prior to this, ‘arabiyya is said to be a language variegated in tribal dialects across the peninsula, with its colloquial and poetic usages. 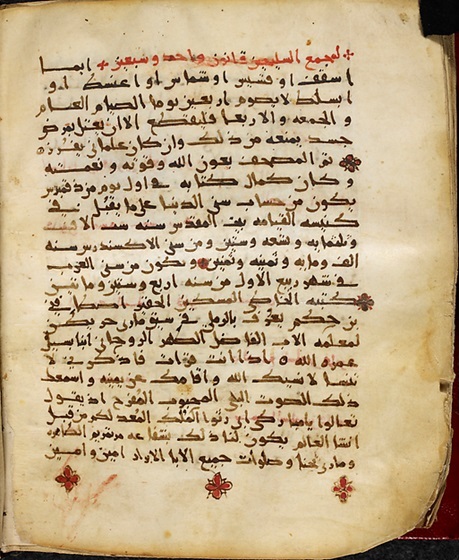 As the Qur’an took its form, it brought unique forms of neologism into the semiotic space of Arabic language, thereby investing words with special meanings. This amplification would expand the significance of a revelatory language medium that would resonate for generations. Solidified by claims of selective justification in the Qur’an (passages like Q.5:15, 12:1, 26:2, 27:1, 28:2, 44:2) Arabic came to represent a language conveyed from the divine realm and more importantly a language of a swaying religious civilization stamped in mosque inscriptions, coins, legal documents, theology, and translation of Greek works. By the ninth century, Christians living under Islamic rule began to compose their theological rejoinders in the sacralized language medium of Islam. The Melkites were one of the Christian traditions in dialogue with their Muslim debaters. Having decided to stick to the Orthodox ecumenical councils, coupled with a separation from Greek and Latin Christians at the time of the Crusades, the Melkites were left to fate. This was the fate to preserve their Greek Christian heritage and shape their doctrinal identity both distinct from other Christian groups and within the realities of a new religious civilization. Prominent features in the writings of Melkite Christianity during this period were the use of qur’anic terms, quotations, and allusions from Islamic theology. What does the attitude of Islam and Melkite Christianity, during this formative stages of their history, toward Arabic as a language indicate about the function and significance of language endowed with sacrality in the construction of religious identity and inter-religious communication? The consideration that elements of communication and language modes can foster a sense of validity and revelatory superiority for religious communities urges the need to explore the religio-linguistic nuances and behavioral patterns observable in this late-antique eastern religiosity. This exploration is what my research is interested in. This inquiry will constitute three major phases. The first is a closer look at the qur’anic passages that utilize the adjective mubīn (clear) in testifying to the Qur’an as a kitāb (book or collection) that came in no other language but a ‘clearly communicated’ ‘arabī. The second is the nature of qur’anic testimony about its human agent and prophet – Muhammad. The last would be an examination of Melkite theological documents that survive from the eighth to early tenth century. These three elements create a chain that is instrumental to our inquiry: the Quran’s authorization of the language of its revelation by insisting on its clarity and transcendental worth – a passive agent being presented as a capable channel for the revelatory flow – and then the resonating reaction from a neighboring religion. The self-referentiality of the Qur’an in relation to the Arabic language exemplifies a revelation that showed particular interest in the spoken idiom of a particular people within a given context. Scholars have observed that this manner of linguistic consciousness is unprecedented in monotheistic traditions. The need for the qur’anic audience to hear and reckon with this linguistic preference could be pointing to a mantic effort to create a special niche of religious identity within a context of diverse but shared religious history. Subsequent claims, such as the inimitability and infallibility of Qur’anic Arabic, may have derived from this emphasis on language. With such claims, the language of revelation, which is peculiar to Islam as a religious tradition, becomes the sin qua non of the superiority of its revelatory tradition. The name of the prophet Muhammad occurs just but four times in the entire qur’anic corpus. But his image is fairly well-represented. Much of this imagery, if not all of it, is related to the message he was called to proclaim. When Muhammad was personally criticized, the source of his revelation was rather emphasized in response. In fact, the figure of Muhammad as portrayed by the Qur’an was, at least in most Meccan suras, of no powerful, brave or intelligent quality. Rather, he was timid and passive. But most early Medinan suras indicate a transition to a more confident and authoritative figure. Muhammad’s late awareness of his revelatory source to be Gabriel and the gradual rise of his authoritativeness do portray a prophetic personality in negotiation with things mostly outside of his control. All that Muhammad said about himself could be concluded as one who was loyally bound to the message he was obliged to proclaim. His opinions of himself were couched in the words of his revelatory source. He was instructed to speak of himself as only a human being – a mere mortal (Q. 18:110), just a messenger (3:144). There is also a frequent reference to him in the second or third person. This may either be something deliberately self-effacing or allowing for flexible interpretation. One could say that this phenomenon is understandable, since, having been chosen, he might have lost a right to himself. But this subservient tone with which he established himself as a mere messenger came to serve him well when, after the battle of Badr, he would declare to his followers, in strong, judgmental, and authoritative tones, the need to obey God and ‘His messenger’ (4:13-14; 48:13; 33:53; 49:2-3). As long as qur’anic testimony is concerned, therefore, there has not always been a fixed, brave, praise-worthy Muhammad. Rather, he is depicted as someone who gained his historical significance and symbolism in negotiation with his revelatory task. It is very possible that the prophet’s name would continue to resound significantly among his followers. However, the name was not always what it is; rather, it came to be in connection to a message, its source, an audience and a context. This coming-to-be perspective indicates that it would be damaging to the progressional nature of Qur’anic representation of the prophet to conceive of him from a fixed-mode point of view. If anything was fixed, it was the command to recite the message in the sacred language. The implications of an increasing awareness of himself and his religious role may be that some of what is indicated in the Qur’an about the prophet dates from his lifetime but much of which may also have derived from a time when it was felt that his task and mission needed to be amplified to underline the uniqueness of the Arab religion that was rapidly taking shape after his death. A successful prioritizing of Arabic as a language of spirituality was not only beneficial for Islam itself but also a valuable means of communication for Melkite Christianity. When language serves as a means of concretizing the supernatural, those who seek to communicate with possessors of the said language may adopt this refined linguistic means in the bid to build an appealing manner of communication. Perhaps the duration and nature of dialogue between Christian and Muslim scholars during the early years of Islamic rule attest to the linguistic concessions that are imperative for any meaningful communication. With this research consideration in mind, I am very happy to receive any idea, suggestion, and contribution from scholars and experts in this field. *Samuel Nwokoro is an MA research student of the seventh-cycle of the Religious Roots of Europe (RRE) program at the Faculty of Theology, University of Copenhagen. He previously studied Church history at the Theological College of Northern Nigeria (TCNN). He is interested in Late Antique Judaism, Christianity, and Islam.